Dean Liao Xiangke has made a prestigious cut in China Open Source’s Leads! The 13th 2018 Open Source China Open Source World Summit, organized by China OSS Promotion Union had been held during June 28-29,2018. 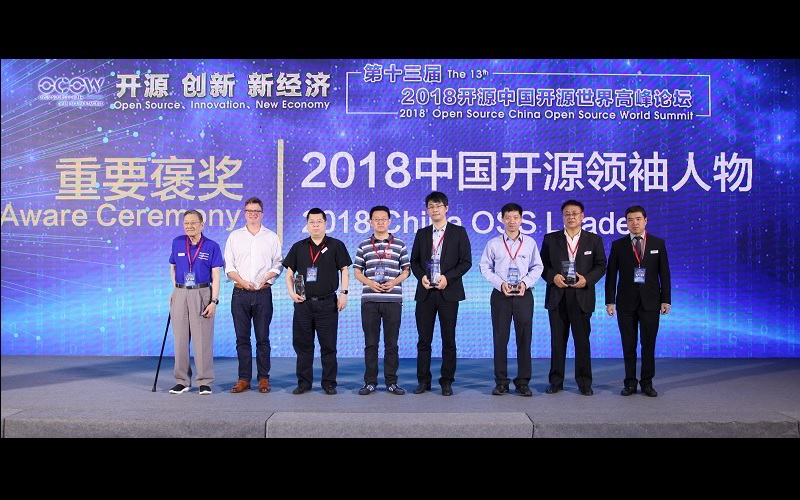 Liao Xiangke, the chief designer of Ubuntu Kylin Operating System and an Academician of China Engineering Academy, has been awarded the first “China Open Source’s Leads”, also including Linus, Jim Zemlin, Lu Shouqun, Ni Guangnan, Gao Wen, Mei Hong and so on. This Summit is about Open Source, Innovation and New Economy. The keynote speeches has invited Jim, the executive director of Linux Foundation , George, the president of FreeBSD Foundation, Todd, the vice president of IBM open technology, Li Shipeng, the vice president of IFLYTEK, Cui Baoqiu, the CTO of Xiaomi and experts from Huawei, Baidu, VMware, JD, Alibaba, Lenovo, Intel, Didichuxing, Inspur and so on. Previous：Getting Start with Ubuntu Kylin 18.04 Next：Enjoy Snap pacakge for kylin-video on Ubuntu and Ubuntu Kylin!